After a brief 0.1% rise in inflation in June and July, Spain's National Statistics Institute (INE) estimates the CPI stands at ‒0.9% in September, five tenths lower than that registered in August. The above is a "flash" reading. The INE reports Spain's HICP (Harmonised Index of Consumer Prices) a measure that normalizes Spain with the rest of Europe "stands at ‒1.2% [year-over-year]. If confirmed, the annual change of the HICP would have decreased seven tenths as compared to the previous month.". 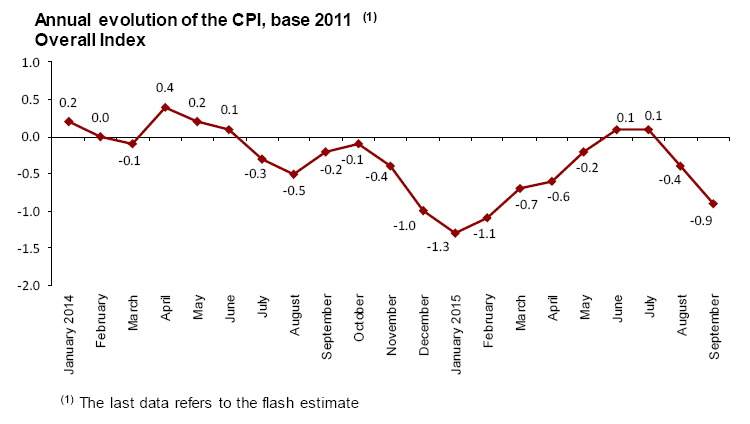 Spain is Europe's fastest growing economy, but ECB president Mario Draghi is hell-bent on putting an end to deflation. Of course, we are talking about price deflation, not monetary deflation, not asset bubble deflation, not credit deflation. Central banks and economists alike would be best off not caring one bit about routine price deflation.